I still remember the graduation ceremony of political economy course I had taken in Hong Kong in July 2010. As a keynote speaker we had a North Korean party official who had fled to South Korea and had been raising voices against human rights abuse in North Korea. In his speech, he described how the life had been like in the 'hermit kingdom' and why he , despite being a well-to-do party official had fled the country risking his and his family's life. "The day I arrived in South Korea I realized my whole life had been lived in a lie. Seeing South Korea's roads packed with cars of different colors and models, I thought maybe today's some special day here.In North Korea we were told South Koreans were extremely poor and they didn't have enough to eat. So, I thought maybe it's some special day to have so many cars on the road like we used to in North Korea. To my utter disbelief, I came to know that almost everyone has a car in South Korea and I had been living in an illusion", he said. Hearing this from a well-to-do party official from North Korea had given me an inkling of how brainwashed the North Korean society is. Fed with an alternative version of reality in order for it to be manipulated and controlled, one can only feel sorry for these 30 million unfortunate people. However, reading this news recently has made me more hopeful for these people and increased my respect to some extent for the file sharing pirates. 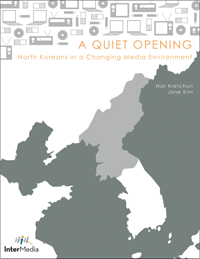 According this news developments in technology are giving citizens of North Korea new access to information and insights into life beyond their borders. Note: The full report of A Quiet Opening can be downloaded from this link.